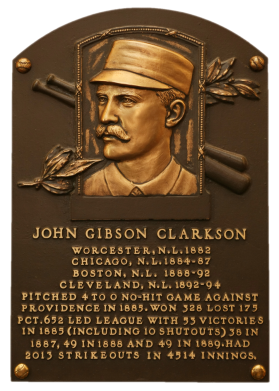 An early master of the curveball, John Clarkson excelled during the years when the pitching distance was a mere 50 feet. Six times he hurled more than 400 innings, twice more than 600. 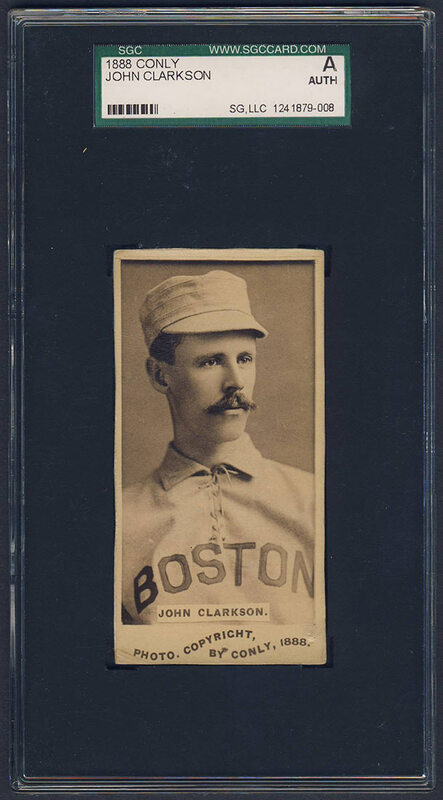 In 1885 with the White Stockings, he went 53-16. 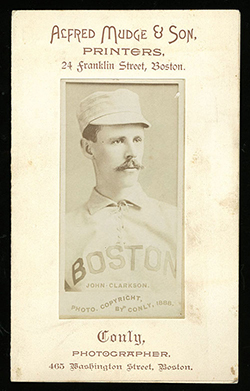 With the Beaneaters in 1889, Clarkson's record was 49-19 in an incredible 73 appearances. 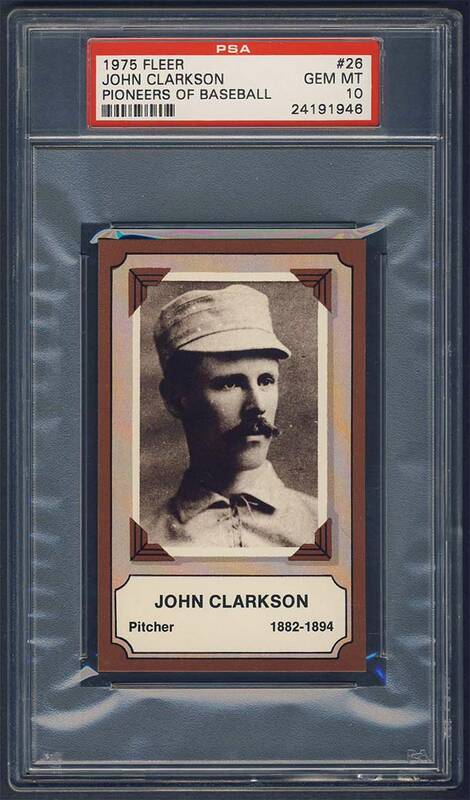 Winner of 328 games for his career, head had 485 complete games and led the NL in strikeouts four times. Comments: I wasn't in a position to buy a period piece of John Clarkson when I started putting this collection together. I ended up finding a 1975 Fleer tribute card at as baseball card show (National?) and had it graded by PSA shortly thereafter in March, 2004. I've been looking for a contemporary replacement ever since but its been a tough search. UPDATE: Within a couple weeks of the Four Base Hits Clarkson card selling, the spring Robert Edwards Auction kicked off and when I looked through the preview one card caught my eye. The quality of the 1888 Conly image is impeccable - perfect light and perfect resolution. I placed a bid and was the high bidder up until the final day of the auction. That evening of April 25, 2015 my wife and I had date night and we were at a local pub / restaurant crawl called Totally Tennyson she helped organize. It was late and I checked my emails for the first time all evening. The REA reminder emails popped up on my cell phone. CRAP! I had totally forgotten about the auction. I pulled up the REA contact information and called the auction house just in time to place a bid. It was after 1am MST (3am on the east coast). Brian Dwyer, a hobby friend, answered the phone and I asked him to call me back if I was outbid. I didn't get a call. The following morning I checked my account to see if it was true and sure enough this beautiful card showed up on my laptop screen! 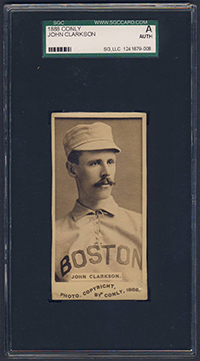 In 1888 a somewhat obscure photo studio in Boston produced a series of cabinets per the patronage of diamond hero, John Clarkson. Several different poses of the great hurler were developed at cabinet dimensions. This item measures about 2" x 3-7/8" and it was most likely produced from the same Clarkson-Conly engagement. 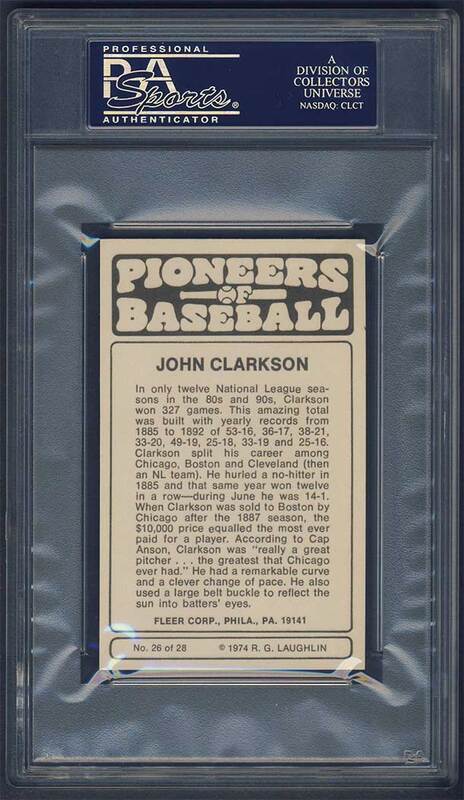 This piece is actually far rarer than even the rarest nineteenth-century baseball sample cards, with only three or four examples known to exist. All feature John Clarkson. Issued jointly as a promotional piece by the well-known Boston photography studio of Conly and the printing firm of Alfred Mudge & Son, the piece, at first glance, resembles a fold-over scorecard from the era. 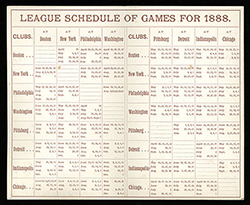 However, when the two sturdy card-like pages comprising the design are opened, the interior displays not line-up cards, but the complete National League schedule for 1888. Conly Studio's copyright notice is printed directly under the mounted Clarkson portrait photo, and the front cover prominently features the company names of both Conly and Boston printer Alfred Mudge & Son. 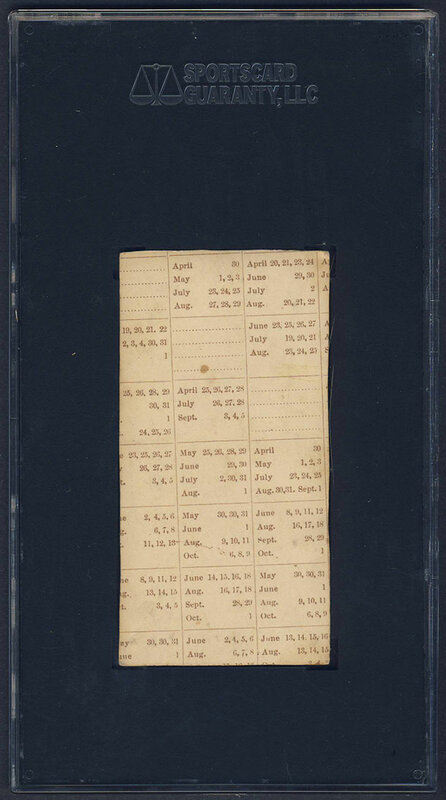 The back cover again displays the names of each firm, along with a calendar for the whole year, a listing of Boston's home dates, and the dates for a number of local Ivy League college baseball games. The Conly advertising text below Clarkson's portrait ("Photo. Copyright, By Conly, 1888") is so similar to the lettering of S. F. Hess cards of the same year, that we believe this suggests that the S. F. Hess cards were perhaps also produced by Conly and/or Mudge.